The venue, food and drink, music, the dress, hair and make-up… a bride’s checklist can go on and on. And Princess Eugenie has added another factor into the equation – her wedding has to be plastic free. The Queen’s granddaughter, who is marrying Jack Brooksbank on 12 October, told British Vogue that the couple’s house was anti-plastic and “Jack and I want our wedding to be like that as well”. It’s just one day, why bother? “A wedding is such a significant day that it’s even more important to be true to your values than on any other day,” says Lindsay. Plastic finds its way into weddings in many forms: food storage, drink packaging, decorations, flower delivery – that’s just the start. For Lindsay, who blogs about living without waste, trying to make her special day plastic free came first ahead of any other wishes. They wanted “memorable” but didn’t want to break the bank. Simplicity was also key. “For me, simple means no fuss – and devoting whole weekends to projects was out,” says Lindsay. But it is also about taking matters into you own hands. For their wedding, they hired a pizza oven and used a local deli to provide the fresh ingredients – without plastic packaging – but did they know what went on behind the scenes? 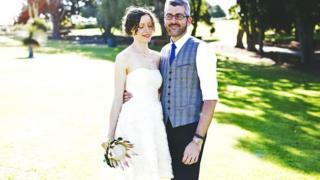 The wedding’s eco-friendly credentials were counterbalanced by the air miles required to fly her family – albeit just four people – to Australia. “In hindsight, I should have fallen in love with the guy in the village – but I didn’t,” Lindsay jokes. Wedding planner Katrina Otter says working with the right people is key, as some of the more “old-school suppliers” are less keen to adapt. And, traditionally, a key part of those has been the floral foam – the bricks of green, spongy foam that provide a foundation for floral arrangements, as well as a water source. The florist who created the displays for the Duke and Duchess of Sussex’s wedding, Philippa Craddock, says she didn’t use any floral foam for their big day. Another issue to consider for any bride – especially one who is having live TV coverage – is the hair and make-up. Kate Arnell, who blogged about her zero-waste wedding, in 2014, says she found it tricky to find plastic-free make-up and hair products. “Now, there are a lot more available and I have since swapped to plastic-free alternatives,” she says.